This report is for Captain Daves Guide Service. He asked me to post it for him as he is fishing the Vernita area and was unable to log on. divers or in deeper water using my downrigger's. Both method seem to be really effective. I'm concerned landing salmon is a bonus. angler discount on a salmon trip. Feel free to call me for details. camping area is and how much revenue the state generates because of it. Thanks Al for helping me out. I also see I made a typo. Meant to say WDFW. Thanks for the report. It has been awhile since there were any updates. 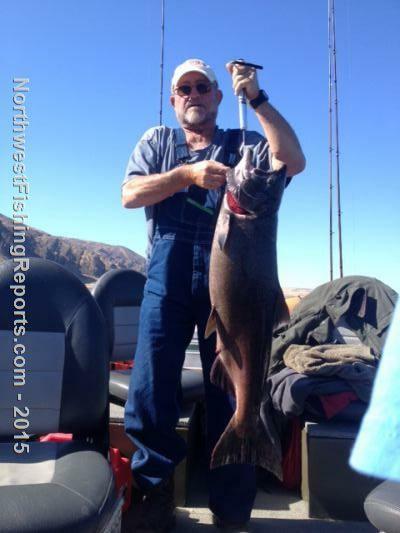 If anyone has any info on the fishing above Wanapum dam, I would appreciate the input. I cant launch below the dam and not confident enough in my captain skills to fish Priest Rapids area. Tight lines. Do you eat those?. Look fun to catch though. By the way Captain Dave's phone number is 509-939-6727. He is great to fish with and works hard to get his clients on fish. Give him a call if you would like to book a trip. very edible, the ones we caught were delicious!